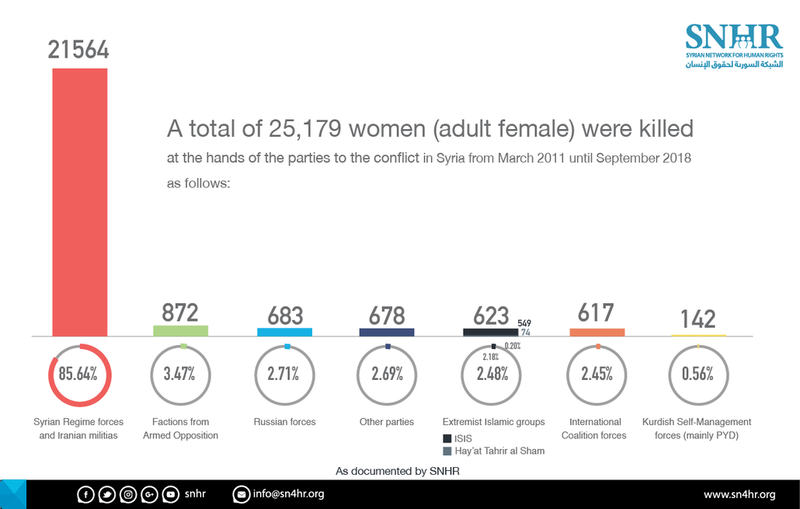 The Syrian Network for Human Rights (SNHR) has published its latest calculations about the civilian death toll (including women and children) in the Syrian civil war. The results of its research are both shattering as well as revealing. 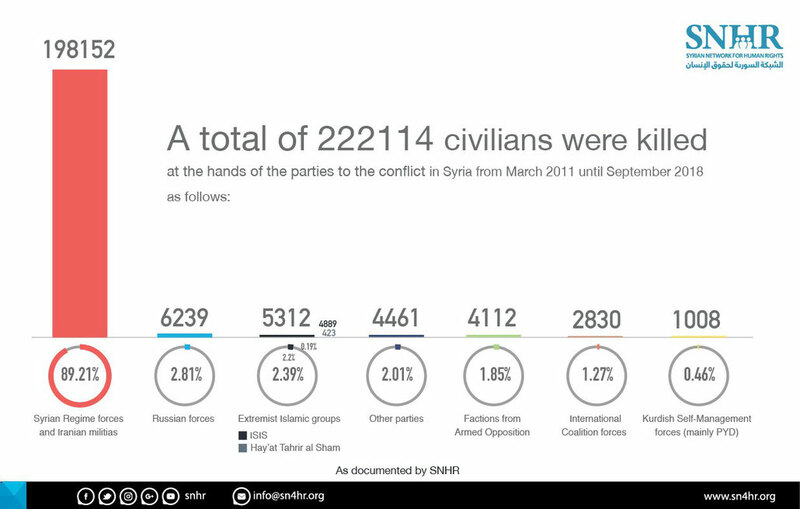 According to the SNHR a total of 222114 civilians have been killed between March 2011 and September 2018. Among them are 27,989 children and 25,179 women. (See the three Charts below.) This is a graphic demonstration of the horrible consequences of the barbaric war which the Assad tyranny has began when it started to slaughter peaceful demonstrators in spring 2011. There are only few wars in recent history which bear a similar barbaric character – the horrific civil wars in Congo and Sudan as well as the slaughter of the Chechen people by Russian imperialism (1) and of the Bosnian people by Serbian chauvinists (2) come into one’s mind. The study also calculates which parties are responsible for how many of these casualties. The results are revealing. As it is well-known, the pro-Assadist and pro-Russian media (including their Stalinist and semi-Stalinist minions) like to denounce the Syrian liberation fighters as “terrorists”. (3) The Western media – which are more critical against the regime in Damascus because Assad is a puppet of Moscow and not of Washington – are more selective. But they too regularly slander the Islamist rebels (like Hayyat Tahrir al-Sham/HTS) as “terrorists”. The latest SNHR study reveals, once more, who are the real terrorists in Syria. It is first and foremost the Assad tyranny! The regime is responsible for nearly 90% of all civilian death, for more than 85% of all women and 80% of all children killed. These shattering figures prove us right once again that the capitalist dictatorship of Assad – and its Russian and Iranian masters – is the main enemy in the Syrian civil war and that all revolutionary, democratic and righteous forces must support the insurrectional people fighting for freedom! The charts also reveal that the imperialist armies likewise act as killing machines – first and foremost Russia (4) but also the U.S., France and Britain. (5) Despite the fact that they have relatively few troops on the ground, their air forces have killed more than 9,000 civilians since they began their intervention in 2015. Compare the mass killing of civilians by the Assad regime with the relative small figures for which the rebels are responsible – despite the fact that they had for many years up to 200,000 fighters in their militias! The facts revealed by the SNHR demonstrate once more that the rebels are a force representing the people and their struggle for freedom. Their strength relies on the support by the popular masses without which they could not survive. In contrast, the strength of the Assad regime relies on terrorizing the people and its support from a monstrous military machine boosted by the air force and troops of Russia and Iran. It is also noteworthy that HTS – the petty-bourgeois Islamist movement which is the most intransigent force in the struggle against Assad and Russia – is responsible for less civilians killed (including women and children) than anyone else! This is also true in comparison with the Kurdish PYD/YPG which is the darling of the Stalinist pseudo-left. And this despite the fact that HTS is the most significant and strongest force among the rebels. (7) It should be mentioned that SNHR has no sympathy for HTS which is demonstrated by the fact that it lumps it together with Daesh/ISIS in its charts. All these facts confirm once again the urgent necessity of all socialist, democratic and righteous forces in Syria and around the world to continue the support for glorious Syrian Revolution. The RCIT calls all similar-minded organizations and activists to join forces in fighting for this sacred goal! (7) For our characterization of HTS see e.g. RCIT: Denounce the US terror listing of Syria’s Hayyat Tahrir al-Sham! The Trump Administration delivers another blow to the Syrian Revolution. Continue the Solidarity with the liberation struggle of the Syrian people! 03.06.2018, https://www.thecommunists.net/worldwide/africa-and-middle-east/denounce-the-us-terror-listing-of-syria-s-hts/; Michael Pröbsting: Is the Syrian Revolution at its End? Is Third Camp Abstentionism Justified? An essay on the organs of popular power in the liberated area of Syria, on the character of the different sectors of the Syrian rebels, and on the failure of those leftists who deserted the Syrian Revolution, 5 April 2017, https://www.thecommunists.net/theory/syrian-revolution-not-dead/; Michael Pröbsting: World Perspectives 2018: A World Pregnant with Wars and Popular Uprisings, February 2018, Chapter V, https://www.thecommunists.net/theory/worldperspectives-2018/chapter-v/.